Come learn what we do and how we help manufacturers to succeed. If you're planning to produce a local product, this session is for you. A unique opportunity to see a sewing factory in action! If you're planning to produce sewn apparel or accessories, this session is for you. This popular panel returns with three new female leaders in the industry. It's our favorite time of year again! On Wednesday, May 8th, SFMade will host its fourth annual Ramp it Up! event- San Francisco’s largest and most dynamic celebration of the manufacturing sector and its contribution to the economic vitality and diversity of the City. We expect over 500 local manufacturers, business leaders and community steak holders to attend the event- hosted at the spectacular new Heath Ceramics factory in the Northeast Mission. Tickets available here. Ramp It Up! is part of SFMade Week 2013, seven days of education, exploration, and innovation, designed to celebrate and heighten awareness and understanding of the local manufacturing sector and the companies and people who bring locally made products to fruition. Stay tuned for more info. Product We Love: We love Liz Palacio's collections of stunning, elegant, fun fashion jewlelry— made in San Francisco since 1987! Her turquiose and crystal cabochon cocktail rings are pictured here. I want one! Visit their website or facebook page. About: The factory of California Saw and Knife Works on Brannan and 6th Streets has equipment that's survived the 1906 earthquake. We're not quite sure if they're the oldest manufacturer in San Francisco (Phoenix Day in the Bayview comes close), but they're most certainly veterans in the industry. 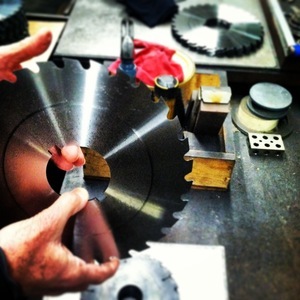 Four of the ten employees here are family members, carrying on a long tradition of designing and manufacturing circular saw plates for the lumber industry, as well as knives used in food processing machinery around the globe. How SFMade has helped them: When faced with a new energy ordinance, the owners, Karen and Warren Bird, were worried about new costs. They came to the SFMade workshop, "Save Energy and Reduce Your Bill," in November with PG & E and SF Energy Watch, where they made the connections they needed to save thousands of dollars . "The money we saved was a direct result from that workshop," said Karen. Learn more about California Saw & Knife Works here.